We’d love your help. Let us know what’s wrong with this preview of Epidemic! by Frank G. Slaughter. To residents of Manhattan, it was just another blistering hot day in August. No one knew that on that day death, in the form of a ghostly exodus of vermin-infested rats, had moved silently into the streets of the city. The ghastly plague, known as the Black Death, was loose on Manhattan. Behind the germ warfare was an unknown enemy and a willing underworld who joined forces To residents of Manhattan, it was just another blistering hot day in August. No one knew that on that day death, in the form of a ghostly exodus of vermin-infested rats, had moved silently into the streets of the city. To ask other readers questions about Epidemic!, please sign up. Be the first to ask a question about Epidemic! This was a fun read. I kept imagining this would make a great cheesy picture. Of course, unless it was filmed in the past it would lose some of its charm. 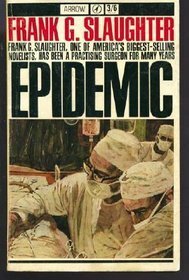 This oldish novel reminded me very much of the medical television series that have been so popular since the '90s' 'ER', and it leads me to think Frank G. Slaughter's work provided some of the inspiration for it. Not only is it filled with intriguing medical terminology and explanation, there is all the angst of romance (at least in the traditional love triangle sense), and there is plenty of tension with two forms of plague hitting New York City just as the underground rebellion seems to have o This oldish novel reminded me very much of the medical television series that have been so popular since the '90s' 'ER', and it leads me to think Frank G. Slaughter's work provided some of the inspiration for it. Not only is it filled with intriguing medical terminology and explanation, there is all the angst of romance (at least in the traditional love triangle sense), and there is plenty of tension with two forms of plague hitting New York City just as the underground rebellion seems to have organised the self-destruction of the city. I enjoyed the novel for the most part, though it dragged a little near the end and was predictable in how the city recovered from near-disaster. However, I was pleasantly surprised at the outcome of the love triangle. Ya know, it was written 50 years ago, pre ISBN. Ancient. But still a fun romp thru the Black Death attacking New York, with some Cold War skullduggery thrown in. Lots of medical stuff, descriptions of the disease, etc., that are interesting. Pretty realistic view of how a large city would handle an epidemic like this. Good thing Manhattan is on its own island - lowers the bar for preventing folks from escaping quarantine. Reread. Last time was probably when I was in my teens. Kinda fun. And everyone lived happily ever after... except for those poor souls who died of the plague. An underground rebellion hits NYC at the same time as the plague and for awhile there is concern that they are related. This is a really old novel and I'm sure the story was much more dramatic in its day. It would have made one of those compelling afternoon movies back in the day (pre CGI and all that nonsense). Frank Gill Slaughter , pen-name Frank G. Slaughter, pseudonym C.V. Terry, was an American novelist and physician whose books sold more than 60 million copies. His novels drew on his own experience as a doctor and his interest in history and the Bible. Through his novels, he often introduced readers to new findings in medical research and new medical technologies. Slaughter was born in Washington, D Frank Gill Slaughter , pen-name Frank G. Slaughter, pseudonym C.V. Terry, was an American novelist and physician whose books sold more than 60 million copies. His novels drew on his own experience as a doctor and his interest in history and the Bible. Through his novels, he often introduced readers to new findings in medical research and new medical technologies. Slaughter was born in Washington, D.C., the son of Stephen Lucious Slaughter and Sarah "Sallie" Nicholson Gill. When he was about five years old, his family moved to a farm near Berea, North Carolina, which is west of Oxford, North Carolina. He earned a bachelor's degree from Trinity College (now Duke University) at 17 and went to medical school at Johns Hopkins University in Baltimore, Maryland. He began writing fiction in 1935 while a physician at Riverside Hospital in Jacksonville, Florida. Books by Slaughter include The Purple Quest, Surgeon, U.S.A., Epidemic! , Tomorrow's Miracle and The Scarlet Cord. Slaughter died May 17, 2001 in Jacksonville, Florida.